The MS Caledonian Sky offers all the comfort and modern technologies that you would expect for your cruise. The ship boasts spacious and well-designed cabins, endless entertainment and fantastic dining options. 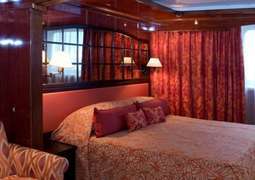 On board the MS Caledonian Sky everyone will find their perfect Suite to call home away from home. With all Suites enjoying ocean views you can rest assured you will not miss any of the amazing panoramas as you cruise. All cabins are designed with sophistication and comfort in mind, featuring elegant en suites and state of the art amenities, providing you with a first class experience. 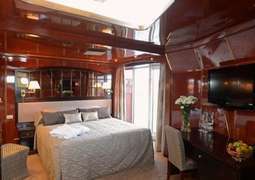 The wood panelling and brass features give each Suite a classic and unique feel and the living room area and balconies in some make them the perfect place to call your own for the duration of your trip. While cruising on board the MS Caledonian Sky the team of highly talented chefs will provide you with a range of fresh and delicious dishes, sure to please all passengers. You will get plenty of opportunities to taste the local cuisines of the places you visit, with chefs buying fresh regional produce daily. The elegant Dining Room is the location for most of the meals on board serving delicious buffet breakfasts and intimate meals in a relaxed and friendly atmosphere. The outdoor dining area is perfect to dine Al Fresco and enjoy the scenic views. All your needs will be looked after by dedicated and attentive staff. The entertainment on board the MS Caledonian Sky is sure to keep all passengers happy with a range of activities. The onboard entertainment ranges from enlightening lectures about the regions you visit to classical pianist performances in the elegant lounge. Enjoy a drink in the bar or find a quiet spot in the library to enjoy a good book. 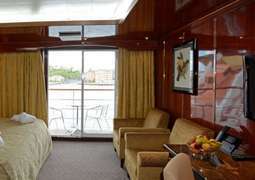 There are many areas on board to unwind and take in the beautiful scenery such as the Sun Deck and the Panorama Lounge. Why not head to the gym and get a sweat going or make an appointment at the hair salon and change up your look.